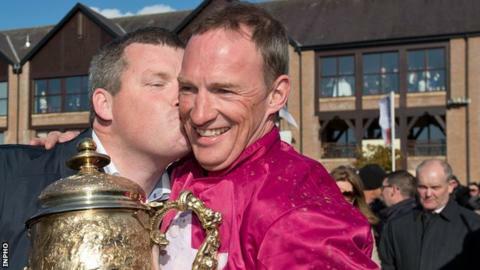 Don Cossack, trained by Gordon Elliott and ridden by Paul Carberry, won a competitive Gold Cup on the second day of the Punchestown Festival. The 5-2 second favourite strode away from market leader and Cheltenham Gold Cup runner-up Djakadam to land Wednesday's feature. Galway Plate winner Road to Riches came in third at the County Kildare course. The now retired AP McCoy rode Don Cossack to a Grade One victory in the Melling Chase at Aintree on 10 April. The eight-year-old, owned by Michael O'Leary, had been in great form over two and a half miles this year and proved capable over the extended distance of three miles and one furlong. "We were nervous about running him," revealed trainer Elliott. "We wondered if he would stay the trip. "This is brilliant and I am very lucky to have a horse like this." Veteran Carberry took the ride as Bryan Cooper elected to partner Road To Riches. Djakadam and Road To Riches, second and third respectively in the Cheltenham Gold Cup, led the field into the straight, but Carberry was close behind aboard Don Cossack and he kicked clear from the final fence to seal a seven-length victory. Carberry said: "He jumped well the whole way. Any time I asked him, he answered. "He showed he will be a Cheltenham contender next year."